Having worked in the Cumberland Gap area back in the day, I’d drive up 25E through Tazewell TN, past the Mustang Lounge, and wind my way through the gap toward Middlesboro Kentucky. Why do I remember these places so well? I was standing in the back room of a grocery store in Middlesboro the day my grandfather died. It’s funny how a place can become an integral part of life’s most important moments, and memories. Circumstance insists that the sensory elements you recall and the emotion that filled the moment are forever connected. Isbell puts that very human process to full use in “Cumberland Gap”. I think it’s part of why I like this song so much. I feel like I know the place. It’s tangible for me. But even if you haven’t been there, the the magic of Jason Isbell’s songwriting is his ability to create emotional situations and sensory images that are universal despite being so specific to a place. Isbell has the ability to create compelling moments that use conversational language as a driver of the discovery. You pick one or two of the devices and write them into your own song! Perspective is a key element of this song because the entire thing is an internal conversation that a listener has to find commonality with in order to stick with it. Often, highly introspective personal songs use some many references only the songwriter understands, the listener is often left outside the song. “Cumberland Gap” does a great job of having an internal perspective, but pulling the listener in by using conversational language. Isbell recounts very personal moments like the main character’s drinking as a solution for the life that’s enveloped him, juxtaposed against his father’s acceptance of his role as caretaker and miner. Through conversational language he brings texture and imagery into the song without losing the listener. How does he achieve it? Another key element of the song is repetition. And, since repetition is one of the techniques you can use to create a commercially viable song, it makes sense to highlight the double duty repetition does here. The chorus in Cumberland Gap is a single repeated line. Granted, common enough in blues tunes, but not so common in other genres. After all, the chorus is supposed to be the big moment! So why do it? You’re always told that the chorus should sum up everything, be the big statement of the song. “Cumberland Gap” does it in a very different way: by making the chorus a question. Despite the simplicity of the chorus, there is a subtle nuance that informs the rest of the lyric each time it comes around. The word “maybe” brings a unique meaning to the chorus, and gives the listener an insight into the speaker’s reluctance to really judge his place of origin, and ultimately his choices. Unlike a more traditional structure, the bridge feels like it shows up early in this song by placing a verse after the bridge. The result is the sense that an insight occurs sooner in the song than would normally be expected. The songwriting question then becomes – why do it? The transformation of the chorus is aided by the rhyme pattern and the “chain linking” between the chorus and bridge. This song is an exceptional example of how to use a simple AA BB rhyme pattern and highlight key song elements like the bridge by switching up the pattern, but still creating a rhymed link to the rest of the song. Rhyme patterns are a technique to manage pace, create subtle connections, and keep your listener engaged through the entire song. If you strip away the crunchy guitar and imagined this played on an acoustic guitar, what does the groove feel like? Oddly, it feels like an up-tempo song, but the introspective nature of the song keeps the intensity to a controlled boil. Because of the low-key approach to the lyric, contrast is achieved through the use of phrasing changes between the song parts. By crafting the phrase lengths, Isbell creates a simple, auditory way for the listener to know they’ve hit a different element of the song structure. And, he manages to tie phrasing with a chord progression that highlights the phrasing shifts. See how this song compares to others in terms of word count, reading level, and song lyric stats. 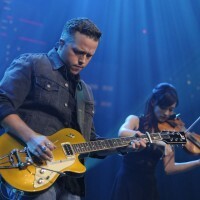 Apply Jason Isbell’s Techniques To Your Songs!